As I sit here in my office, contemplating the next chapter for the Orianne Society, I remember sitting at a local brewery with a fellow graduate student 15 years ago discussing species conservation. I was amazed that there were so many resources in the world, but so few of them were going towards preventing species extinctions. I decided that night over beer that species conservation needed to function more like a business, that there was no reason significant resources should only be reserved for the business world. If a difference was to be made, it was time to create an organization to utilize these resources to make a difference. Today I find myself as CEO of a species-focused nonprofit that I designed with those core principles. Some of these principles include providing a great product that people want to invest in, insuring that our approach is driven by objectives with broader goals in mind, and hiring the best people and treating them well. I feel incredibly lucky to have the opportunity to work with species that I have a passion for and to run a company that can work with resources from citizens and put them into preventing species from going extinct. But as many companies experience, we too are beginning a new chapter. The Orianne Society began with a request from a young girl. Orianne asked her father if he could save the Eastern Indigo Snake from going extinct. Together Orianne’s father, Tom, and I have spent the past six years building a family foundation with a single-species mission: fulfill Orianne’s request to save the Eastern Indigo Snake. In those six years we have built a wide partnership across the Southeast that have collectively brought more capacity and resources to saving this amazing snake. 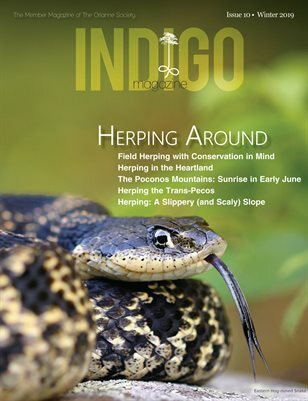 We have designated a region in south-central Georgia as the Orianne Indigo Snake Preserve, and we work with our partners to restore and manage habitats to ensure that this area will always remain a stronghold for Indigo Snakes. We built a state-of-the-art Indigo Snake breeding center and worked with partners to reintroduce over 100 snakes into Alabama, where they have not been seen for some 50 years. Finally, we continuously worked to improve our knowledge of Indigo Snake ecology with inventory, monitoring, and research projects. Our past has been full of great moments, success, and some minor setbacks, but as we look ahead, it is time for the Orianne Society to move on to the next chapter. The Orianne Society is using the momentum from our days as a family foundation to propel us forward as we transition to a public charity. The transition is bringing many new changes to the organization including our location, approach, program structure, and level of public involvement. But there are also many core aspects of the organization that will remain stable and actually be enhanced by the changes. First, we have moved our headquarters to the University of Georgia (UGA) in Athens, Georgia. Our offices are within the Whitehall Forest which is managed by the Warnell School of Forestry and is one of the best remaining examples of protected habitats in the Piedmont region of Georgia. The ultimate goal of moving Orianne and partnering with UGA is to develop one of the world’s leading institutes for reptile and amphibian research, education, and conservation. The move to UGA gives our staff direct links to faculty and students and provides an incredible amount of supportive services to our organization. It also provides the opportunity to work with what is arguably one of the strongest herpetology groups at any university, including multiple faculty across the Forestry, Ecology, and Veterinary Medicine Colleges and affiliated institutions such as the Savannah River Ecology Laboratory, Jones Ecological Research Center, Georgia Sea Turtle Center, and Zoo Atlanta. Orianne’s approach to conservation is ‘Science Fueled, Boots on the Ground, Conservation’–we use science to inform conservation actions. When I was forming Orianne, I saw a real disconnect between the science being produced and the management and conservation activities being implemented. I wanted to create an organization that bridged this disconnect. We use science and our research findings to inform on–the-ground conservation actions such as land conservation. This core approach is not changing with our transition to a public charity. Orianne was founded as a single-species conservation organization, and we are building on the successes we have had with Indigo Snakes to expand the organization to a global institute focused on rare reptiles and amphibians. This broadening of scope does not mean that our work with Indigo Snakes will lose its focus–our work with Indigo Snakes will remain our flagship program, and our dedication will not waiver. So how do we broaden our scope while maintaining our current programs? Very strategically. Our strategic plan has four initiatives. First, the Fire Forest Initiative is focused on conservation in the fire-dependent ecosystems of the southeastern coastal plain. Much of our work will focus on priority species including Indigo Snakes, Spotted Turtles, and Eastern Diamondback Rattlesnakes in the Altamaha River Corridor and on Indigo Snake population restoration in the Gulf Coast Region. Second, the Appalachian Highlands Initiative is focused on the Appalachian Mountains of eastern North America. Our work will focus a great deal on Hellbenders and Timber Rattlesnakes in the Greater Smoky Mountain Ecosystem and on Wood Turtles and Timber Rattlesnakes in the North Country of northern New England. Third, the Citizen Science Initiative is a geographically and taxonomically cross-cutting initiative that aims to involve citizens in science and conservation. We will continue to host place-based bioblitz type events such as our ‘Places You Have Never Herped’ and will continue the development of a reptile and amphibian database through projects such as our ‘Snapshots in Time.’ Finally, our last initiative is one of program development, specifically determining how best to develop a successful international initiative. We are currently exploring the idea of building upon our work in Costa Rica and Panama and the idea of partnering with existing organizations that have a geographic focus but could use a partner like Orianne to develop an initiative in their region. As a family foundation, we worked with our partners but did not involve the public to a great extent. But one of the most important and exciting aspects of our transition is the addition and evolution of our public involvement moving forward. We recently expanded our board to include a broader group of citizens, our membership continues to grow, and we have more and more citizen scientists involved every day. In all these new interactions, I find inspiration as a movement begins and people come together working with Orianne to make a difference. As we begin this new chapter, I realize that nothing is ending but instead we are building on something great. With exciting opportunities to work with conservation dedicated individuals, I think there is a bright future on the horizon for Indigo Snakes and many of the other endangered species.